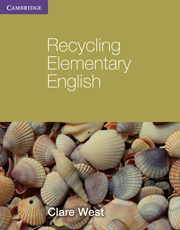 Recycling Intermediate English for lower-intermediate to intermediate students provides extensive guidance and practice in four crucial areas: Grammar, Vocabulary, Situations and Writing. 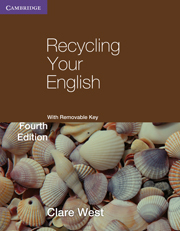 Recycling Intermediate English can be used to supplement any coursebook at this level, in class or for self-study. 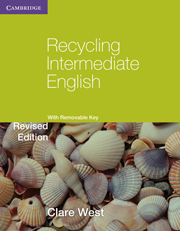 It provides useful extra practice for the Cambridge Preliminary English Test (PET) and the Skills for Life Entry 3 examination. User-friendly units with clear presentation in study boxes. Coverage of all the major PET grammatical areas, topics and writing tasks. Substantial Situations sections, covering a wide range of situations and functions needed at intermediate level. 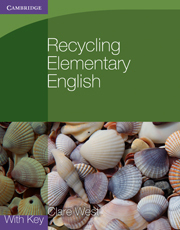 Clear guidance on a range of writing tasks, with useful models.